When it comes to kitchen renovating, kitchen countertops are the first choice for bringing about a transformation. A carefully chosen kitchen countertop could not only make your kitchen look beautiful but also reflect your style. Choosing the right kitchen counter top is essential because you want to look for a surface that is durable yet good looking, can be immune to scratches, rough handling, spills, cold and heat. When you set out to choose your kitchen countertop, you might want to take stock of what you are likely to do on the countertop, as the material plays a vital role. Combinations of two or more materials can be ideal as you will get the proper surface for the job you intend to use it for, letting you set apart one area for work, one for cleaning up and another for perhaps, eating. Your kitchen countertop can be a style statement, and you have a long list of materials to choose from. Laminates are considered most popular and cost-effective and come in different colours letting you choose one that matches your home décor. Laminate kitchen countertops can come with flat or decorated bevelled edges and can look very much like stone. With countertops such as Corian, even though they are expensive the surface is non-porous and can take a variety of treatments like inlays, draining areas with grooves, etc. With stone countertops made of granite, marble, limestone, the cost will be on the higher side but these are matchless in looks and durability as they last a lifetime. Wooden countertops look just great although they must be properly treated so that they do not warp with exposure to water. Metal kitchen countertops like stainless steel are easy to clean and maintain. Kitchen countertops also come in concrete, glass and tile. These can be colour matched to your décor, but you will have to ensure that the grout lines are maintained and kept clean. Wood-slab kitchen countertops are the trend and you will find them in a variety of profiles and finishes. You just must be careful and choose close-grained hardwood countertops. Wood kitchen countertops are more cost effective than granite, which is considered the most popular. However, taking cost and maintenance into consideration, most kitchen renovators tend to go in for the plastic laminate type even though the options are many, like ceramic tile, fibre cement, wood, natural stone and solid surfacing. I can safely say that natural stone, solid surface and quartz finishes are the easiest to maintain. If you happen to spill something on these, it can be mopped up easily. For those who enjoy baking, you would prefer to roll your dough on marble. For a lot of cutting jobs, stone or wood is suitable. If you are looking for colour, you could go in for laminate and solid surfaces. Stainless steel and solid surfacing allow you the flexibility to go in for decorative styles and shapes with integral sinks. Concrete can be a great option when you seal it well. You can also get specialty surfaces like hemp-based countertops and lava stone. The best thing to do is get a combination of surface materials to suit the different tasks on your kitchen countertops – like wood for cutting, granite for serving, tile for that nice look, and a solid surface top for food preparation. Mix and match works to your advantage. Keeping in mind maintenance, durability and the ‘easy-to-clean’ criteria, every kitchen countertop material you choose will have its own pros and cons. So, depending on your space and budget you can find the design that is most convenient. How much your budget is will also vary according to where you live because prices differ from place to place. Kitchen countertop edges must set off the look of your kitchen. The best ones overall are rounded edges, bull nosed and waterfall design, as they are safer than sharp squared off edges. With laminate, you get the ‘no-drip’ waterfall edge where the countertop’s surface is slightly raised before the edge, so that if you spill something it won’t run out onto the floor. It is easy to design solid surface kitchen countertops as they are flexible, and you can make the edge in whichever style you want, no matter how complicated, just like stone or engineered stone. Metal kitchen countertops come with a variety of edges and are designed to contain spills. Wood is of course, easy to mill into any shape you want. The more intricate your design, though, the harder it becomes to clean so make sure you think about that too. There are special edge tiles that eliminate the sharp corners and available from many manufacturers. When we look for the ideal kitchen countertop material the aim is to find one that is strong, resistant to stains and burns, lasts long and looks elegant. You will find a lot of ratings and reviews about the variety of materials and manufacturers in the market. Since kitchen countertops must be chosen according to individual requirements, what suits one kitchen may not quite be the right thing for another. Therefore, it is best to take your own specific needs into account and find the ideal one, after you know the pros and cons of the different materials. With all the different kitchen countertop materials out there and the substantial amount of money you are likely to be spend it is worthwhile to be aware of what is available in terms of choice, as well as the cost and maintenance involved for different types of kitchen countertops. Countertops can really transform the look of your kitchen, so you definitely want to invest some time browsing around before you invest your money. Rather than put all your money on one type of material, it is better to mix and match them, based on specific use. This will not only make your kitchen look more attractive, but also make maintenance easy. The current trend of kitchen décor is to use stone countertops in some areas while using wood in other areas. For preparing vegetables and pastry dough, you might want marble. You don’t have to use granite throughout your kitchen and overshoot your budget. There are engineered materials that give you the look of the real thing so that you have the best of both worlds in terms of durability, looks and cost. The best thing about concrete kitchen countertops is its flexibility in texture and the way it allows itself to be detailed. Since it is porous and can stain quickly, it needs to be sealed periodically. As heavy as granite, concrete must be poured on site and then cured; therefore you need a professionally done job. You can have a neat installation, but in case you plan to remodel again, you will have a big demolition job on your hands. Probably one of the most economical options, laminate kitchen countertops are made from different layers compressed together and bonded. You can achieve practically any look you want with laminates – from marble to granite finish; or something more modern or chic. These countertops look smart and are resistant to stain and moisture. You need to be careful about not placing hot pots on these surfaces as it can melt it. Marble kitchen countertops are a gorgeous looking material for kitchen countertops and just perfect for rolling dough. Unfortunately it is not as long lasting as say, granite. Marble needs to be sealed often so that stains don’t settle. Granite kitchen countertops are highly durable and does not get chipped or scratched. You can do practically anything on a granite surface. About the only thing to think about is the cost factor, as granite is expensive. However, it can last a lifetime. It is less porous than marble. If you would actually rather have granite but are having second thoughts because of its shortcomings, then quartz kitchen countertops are for you. Quartz does not get affected by cooking oils, grease and other stuff. Unlike granite that can have color or pattern variations, quartz is available in uniform color, design and texture. It is durable and requires low maintenance, which is an important factor. Ideal in the kitchen stainless steel kitchen countertops can be long lasting, sleek and look trendy. You will find most caterers, restaurants and professional chefs prefer stainless steel for its hygiene and easy maintenance. It is resistant to water and heat and can be combined for a stylish look with other materials like wood or tile. When we talk of stone kitchen countertops , we are referring to granite, marble, limestone, slate and soapstone. Limestone can look great but it is too porous and has the disadvantage of staining easily. This means great care must be taken to ensure that spills are minimized. There is something called Jerusalem stone that you can consider, which looks like marble yet is harder than marble or limestone. Slate, on the other hand is an age old kitchen countertop material which is naturally beautiful, durable, tough, fire and water resistant. Even though it does not stain easily, you might still have to seal it periodically. Soapstone is equally durable and resistant to acids and stains. A soapstone countertop can complement a soapstone sink very well. Ceramic tile kitchen countertops resist water, heat and stains and can actually last a whole generation. You can customize the color of the tiles to suit your décor. The only minus point is cleaning the grout lines, but that can be countered by treating these lines with mildew resistant material or laying the tiles as close as possible. Among stone countertops, travertine kitchen countertops are unique. Softer than granite and less stain resistant, it needs frequent maintenance. Being porous it has to be sealed while finishing. It is available in a variety of colors. Kitchen designers, however, do not usually suggest travertine for use in the kitchen. Wood kitchen countertops have been used through the centuries. It lends a warm look to any kitchen. Wood has a tendency to warp because of exposure to moisture, so countertops are generally made of ‘butcher block’ which is several pieces of wood stuck together. Wood needs some regular maintenance. As you can see, the choice is huge. The pricing of each type of countertop material would depend on its finish, color, design, the edging, the kind of sink, the seams, etc. You want to choose the material that is right for your needs in terms of appearance and utility. The best way to get started is by browsing online kitchen countertop retailers who are a great resource for information. Concrete kitchen countertops are rapidly becoming popular with homeowners and kitchen designers. Versatile, durable and strong are three words that best describe this unique material. In terms of color and design you can expect an almost limitless choice. Even if the color fades, concrete countertops just continue to look good. Customizability is one of concrete’s greatest plus points since you can achieve any shape and size imaginable. Both prefabricated and on-site installations are possible. For pre-cast countertops, the entire thing is ready to install at the manufacturer’s site. For on site installations, you can get interesting designs, corners, edging etc. You can design the concrete to include inlaid sinks, combining inbuilt cutting boards, drains and trivets. Concrete is composed of cement aggregates, color pigments, fillers and acrylic material. The mix that results from this is then poured on to reinforcement material like fiberglass, meshed fiber, steel bars, etc. to set the concrete. Thereafter, this countertop is cured and polished making it ready for sealing, since concrete is porous. Generally, epoxy is used as a sealer because of its strength and ability to keep off moisture. Concrete can also be combined with glass and marble for a terrific Terrazzo effect. The glass and stone embedded in the concrete give a unique appearance when polished so that the countertop reflects off the light and looks beautiful. Conducive to any design you have in mind; concrete countertops end up being durable, strong and good-looking. Your kitchen will look great for decades depending on the concrete mix used. Concrete also great for rough use. You need to use potholders or trivets if you intend to place something very hot on the concrete. Also, you need to ensure that the surface is sealed every nine months to be long lasting. Some concrete tends to crack over time if not maintained properly. However, these minor things can be easily fixed. Concrete, available in a variety of textures, colors, designs and options can make great kitchen countertop material. You don’t even have to worry about the environment since recycled material reach to the extent of 90% of its total composition. Corian kitchen countertops meet very highly expectations. Any kitchen countertop material must have the ability to resist stains, heat and chemicals while looking great and being easy to maintain and that is what you get with this material. These solid surface kitchen countertops are a mixture of resin, fillers, color pigments and catalysts that is fabricated into a variety of designs and colors. The corian kitchen countertop material itself is highly resilient and available in half inch or three-fourth inch thickness. Some of the countertops are available with backsplashes too. The strongest point with Corian is the variety of colors. Since the color is mixed in at the time of fabrication, there is no question of fading. As a manufactured material, these countertops can be made to resemble any expensive look that you want such as granite, marble, onyx, or just the elegance of natural stone. Of late, quite a few innovative designer styles are available in the market, making these a pleasure to choose from. A major advantage of solid surface kitchen countertops is their ability to be molded into various shapes and designs. Because of this feature, you can make a complementary or matched set in your kitchen including your sinks, cutting boards, drain boards, countertops, etc. Just about any look is possible, depending on the rest of your décor, which is why most kitchen designers enjoy working with it. Customized edges like rounded, beveled, square, etc. are possible along with brass and metal inlays. Corian lends itself to being shaped with wood working tools for the exact look that you want. Durability is one of corian’s strongest points. It is highly resistant to stains and scratches. Minor scratches can be easily sanded out with a cleaner. These surfaces are heat resistant and do not absorb chemicals. Hygienic and easy to clean, corian kitchen countertops are very convenient for those accustomed to being very busy in the kitchen. Probably the only disadvantage of solid surface countertops is the cost factor as compared with the other materials, but in the long run, it could be money well spent. More expensive than some of the other kitchen countertop materials like laminates. For the hygiene conscious, Corian is a great material for kitchen countertops both in terms of maintenance and looks. While possible to install on your own, getting professional installation done will help to customize it to the appearance that you want. Laminate Kitchen Countertops An easy, inexpensive option. In spite of the massive choice in kitchen countertop materials, laminate kitchen countertops continue to reign supreme for its versatility and low pricing compared to many other materials. Not only are laminate countertops durable, but also easy to maintain, as many users will endorse. You can get laminate kitchen countertop material in a variety of colors and styles. Being a manufactured product, laminate lends itself to limitless finishes and textures, and you can achieve the look of other expensive materials without breaking the bank. Laminate can be textured to matte, glossy and granular finishes and also be made to look like wood, marble or granite. This means you can get precisely what you want so that it matches with the rest of your kitchen cabinetry, appliances and overall kitchen design. Laminate is made by bonding paper and particleboard with resin. This is subjected to high heat and pressure, which gives it its solid look. You can buy laminate in sheets or molded with finished edges that can be round or squared. Beveled edges are also available, with the option of wood or brass inlay. If you intend installing your kitchen countertops yourself from sheets, you will be able to cut square edges. The rounded ad beveled edges need heat and pressure to produce that finish. In terms of durability, laminate kitchen countertops have always scored high, going by the number of people who have opted for it. It is a strong material and when you take proper care, can last practically a lifetime of use. Maintenance is not difficult since all you need soap and water to clean, and a soft cloth for mild stains. For tougher stains, baking soda and water works. Some laminates can experience problems with moisture, high heat and can show scratches. Since it is a manufactured product, if water pools around the edges it can dissolve the sealants binding the material. However, there are laminates whose color can mask minor scratches. It is advisable not to cut directly or use sharp items on a laminate surface. If the surface scratches or chips, there’s a tendency for bacteria to hide, so regular cleaning with a good cleaner becomes essential. Laminate kitchen countertops, without a doubt are a sensible option in the kitchen especially for those on a budget. Recent finishes are also environmentally friendly since manufacturers are using recycled materials to make the sheets. Marble kitchen countertops can give a whole new look to your kitchen. This stylish stone was once within the reach of only the very rich but these days, many people are opting for cultured marble countertops that are much more affordable. The range of colors available in marble are very pleasing – you can choose from yellows, greens, orange hues to the striking black which has a beauty all its own. Marble is a metamorphic rock formed by the metamorphosis of sedimentary carbonate rocks like limestone or dolostone. It is found in quarries across the world and you will find most ancient monuments made of marble. Marble can be beautifully sculpted and polished to achieve even the most sophisticated of looks. Marble can also be processed to get different finishes and acquire that antique look that is so popular. You can customize marble to any size or shape you want, with edging, mosaic borders and other embellishments, of course all of this will cost you depending on how fancy you get. Because marble is a porous material it needs to be treated to avoid staining and absorption of moisture and spills. Modern sealants can prevent this so that your marble countertop stays beautiful for may decades, easily justifying the investment you have made on it. Professional installation is the best way to go with marble so that you can minimize breakage and damage. It is hard to beat the looks of marble – elegant, regal, quietly stylish. Marble is highly durable, has depth of color and when finished, looks very smooth and attractive. Every piece of marble is unique, so finding perfectly matching slabs is difficult. Yet, that’s where its charm lies. Just like any other stone material, marble can crack or break, particularly in the drain area. But when well looked after, you can expect at least three to four decades of use. Most damages on the marble can be sanded and concealed. Regular sealing with a stone sealer is essential. You must be careful not to drop glassware on marble and also clean up any spills right away since oil stains and vinegar will show up quite prominently. Marble is fabulous as a kitchen countertop material, so long as you take care of it. It is simply perfect for those who love to bake, since marble is ideal for rolling pastry on its cool surface. Most kitchen designers hesitate before recommending marble because it is expensive and repairs can cost quite a bit. Nevertheless, marble continues to be loved for its stunning looks. Granite kitchen countertops are loved by many homeowners because of its amazing looks and its high resistance to heat and scratches. Highly durable, granite comes in a range of unique natural patterns and colors. When you shop for granite kitchen countertops, you will find that there is never a repetition of the same pattern and each countertop slab is one of a kind. Granite enhances the value of your home no matter where it is but just seems to look more impressive in the kitchen. Granite is a natural stone that is formed as a result of the heat and fusion under the earth. Being an igneous and metamorphic rock, it is resistant to high temperature and heat. Granite is mined from quarries and polished to a high gloss. Once your granite countertop is installed, cleaning it is a simple matter of getting the stains or spills off with a cleaning agent. Granite countertops look very solid and stylish. While ordering your granite countertop, you can have customized edges fabricated into it. Naturally, the more specific you get the costlier it gets, and quickly. It is a good idea, if you decide to install pieces of granite rather than one big slab, to get a few extra squares that you can use for future replacements or repairs. Some maintenance is required to keep your new granite countertop looking great for many years to come. The surface will need to be sealed regularly because it is a porous surface and can absorb stains and become dull over time. Stains can normally be cleaned and polished to restore granite’s natural shine and originally beauty. Granite kitchen countertops come with the natural characteristics of being resistant to heat and scratching. These countertops are beautiful and durable. If you install pieces of granite, it is easy to replace one piece without disturbing the rest of the countertop. If you install granite countertops as slabs, and the slab cracks or breaks, you will have to replace the entire slab and this is a costly affair. Sealing the granite is important to make it resistant to staining and becoming dull. Practically maintenance free, quartz kitchen countertops are versatile and long lasting. Considered a very good choice as countertop material, quartz is resistant to stains, scratches and heat – all very important when it comes to the cooking area. Quartz does not require resealing and you can choose from a wide range of colors. Best of all, it is even stronger than granite. Quartz is made from engineered stone and is a combination of 93% quartz, resin and pigments. Very similar to granite, it looks great with its choice in pattern and color. Quartz is abundantly available and has a hardness rating of 7 and it is non porous. There are several manufacturers that make kitchen quartz countertops and they all use more or less the same process where quartz crystals are ground and mixed with the bonding agents and color, followed by heating and ‘vibro-compacted’ to arrive at what we know as the impervious quartz countertop. Depending on the proportion of materials used, the appearance of the quartz countertops varies. The pigmentation decides the color of the material and you can get as many as fifty color choices. Some surfaces combine mirror and glass which sparkle and will pick up light. The finish is done by polishing it to make the surface glossy. Edging ranges from simple bevels to the more complex designs. Remember that quartz is heavy and you need to get it installed by a certified professional who knows his job and can minimize wastage through cutting, which will also help reduce your cost. Obviously durable and dense enough to withstand any kind of rough use quartz is also easy to cut and handle while installing. Maintenance is easy and this ideal kitchen surface is heat, scratch and stain resistant. For those who cannot afford granite, quartz is a great alternative that looks like granite without the associated maintenance. Quartz is costlier than a lot of other materials used for kitchen countertops, but worth the investment when you weigh the cost against the advantages you get. Other than that, the only thing to pay attention to is proper installation to ensure long-term use with minimal maintenance and cost. Stainless steel kitchen countertops are an excellent choice because of their clean look. Scoring full marks in the hygiene department, stainless steel is amazingly easy to clean. Another high point to this kitchen countertops material is its ability to be recycled; hence you could say it is environment friendly as well. Apart from countertops, steel is also highly suitable for your kitchen backsplashes. A majority of restaurants go in for stainless steel countertops and backsplashes for their ability to take rough use. Stainless steel is composed of steel alloy, chromium and nickel. It does not get stained and is resistant to dents and heat. It is also non porous and because of that it retains its shine and does not absorb spills. You can have your stainless steel countertop by buying sheets and custom designing it, or as a pre fabricated units with basins, tables, drawers etc. You can also get it pre assembled which makes it convenient to mix it with other countertop surfaces in your kitchen. Stainless steel kitchen countertop can be finished as a brushed finish or as a random grain finish. The random grain finish remains clean looking as it has no pattern – so in case you are worried about finger print impressions you will be happy to know that all you have to do is wipe it off. The brushed finish steel has a highly polished and shiny look although it needs a little more maintenance to keep it looking that way. 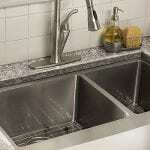 Your stainless steel countertop is durable and will resist spills, stains, heat, rust and moisture. It can also be dent resistant when mounted on a base like plywood. Maintenance wise, stainless steel can be easily kept clean. The best thing about the material is that it can look new for a long time after it has been installed. It is possible to combine the pre-fabricated steel items to come up with the design and effect you want. Compared to some of the other kitchen countertop materials, the cost of stainless steel can be on the higher side, though most users feel that it is worth the investment. Another shortcoming is that it can show scratches, so you might want to be careful about that. A stone kitchen countertop is a hard and long lasting material, usually requiring minimum maintenance. You will find a huge variety in choice of types and colors. Stone is a natural material, usually mined from the earth, cut, and polished. Most stones are unique and it is very difficult to find two identically matching pieces which can be a plus or a minus depending on what you are trying to accomplish. Stone gives your kitchen a nice solid look, thanks to its density. Stone countertops come in different types, from the very expensive granite and slate, to limestone and soapstone. Soapstone can look aged and respectable, while thick black granite looks unusual and stylish and will spice up any kitchen. Soapstone and slate tend to be much softer than granite and also less porous. Slate is available in shades of gray, black or green. Some people prefer rustic roughly hewn stone tiles that are a bit irregular with wide grout lines. The precision cut stone tiles do not need grout lines. Possibly the most popular type of stone countertop is granite, which is the hardest of all the different types of stone. It has a beautiful finish. Stone does scratch, but this can be fixed by simply sanding the scratch out. People often like to have slate and soapstone countertops combined with sinks for that special integrated look. In the stone family, marble and limestone have a warm and smooth look. Unfortunately both materials are susceptible to staining from acidic material, although many users do not mind it. Marble is the favorite for those who bake a lot, since marble is a great material for rolling out pastry because it has a natural coolness unmatched by other types of stone. While marble is smoothed out to a glossy finish, limestone is usually a matte finish. Lava stone is a very hard surface that is available in a multitude of colors. It is glazed with color enamel and is considered a luxury material. Universally appreciated, all stone except soapstone must be sealed because it is porous and can easily get stained. Maintenance is done with a cleaning agent that is pH neutral to avoid any adverse effects. 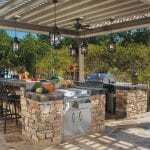 Stone countertops are durable and long lasting and come in a large variety of colors and styles. Stone is an environmentally friendly material and once sealed, does not stain or fade. Stone is heat resistant. Stone also gives your kitchen a timeless and natural look that can’t be matched by other types of kitchen countertop materials. Since stone is hard, you have to be careful about dropping breakable items on it. The grout can crack or stain and needs to be maintained if you want to keep your stone countertops looking their best. Ceramic tile kitchen countertops are one of the best materials for kitchen countertops. Ceramic tiles come in different textures, sizes, colors, patterns, thickness and shapes and are easy to incorporate with backsplashes. Ceramic tiles are composed of clay and a variety of other natural materials. They are exposed to extreme heat to make them strong and durable. Since ceramic tiles are a porous surface so they will need sealant or glaze to make the surface hard, so that it is stain resistant while retaining the tile’s natural look. To get tiles in different colors, pigments are added while glazing so that after the tiles are fired, you get colored tiles of your choice. There is no limit to the colors, finishes and styles you can get with tiles. Tile kitchen countertops can also be made out of glass. Transparent glass tiles are available in different colors. Depending on the grout lines and backing, you can get some really beautiful shades with an elegant look. When it comes to strength and durability, tiles are ranked from I to IV. For tile kitchen countertops, grade III tiles are recommended by most designers. These are long lasting, sturdy and easy to clean when properly installed. Tile kitchen countertops can be quite scratch resistant. Remember, at the time of installation, you must get the proper grout in the right color to install the tiles with a seamless look. Tile countertops are good looking and resistant to moisture when glazed, scratch, fire, water and heat resistant and easy to maintain. They are available in a wide variety to choose from. Tile countertops can get damaged if you constantly place very heavy items on them, resulting in cracked tiles. The tile can also break if something solid and heavy slips on to the tile. The good news is that you can replace broken tiles but there is a possibility of this damaging the tiles around it. Distinctive in looks, travertine kitchen countertops have emerged as an affordable kitchen countertop material with its unique features. The most outstanding example of travertine is the Coliseum in Rome, which is over 2000 years old. A natural material, travertine is a kind of marble that you can get in color variations ranging from gray to coral red and beiges to tans. Because of its pitted surface, it is often filled and sealed so that the porous surface does not absorb food spills and get stained. Although travertine countertops are not as hard as some other stone materials like granite, it is still sturdy enough as a kitchen countertop. Regular maintenance, however, becomes necessary. Travertine belongs to the calcite-type marble family and can be reactive to acidic material because of its chemical make-up. Travertine is formed when hot spring water percolates up through the limestone under the earth and evaporates. The result is travertine, formed of layers of limestone plus other minerals. With the variety available in shapes and sizes, travertine is a great material that can be bought as tiles or slabs. The size of the tile varies from the generous 36-inch tile to tiny mosaic type tiles. The porosity of travertine comes from the gas bubbles locked in it, and when the gas escapes, these holes are filled with crystals. What you get is a smooth stone that looks beautiful. You also get travertine limestone and travertine marble, based on their appearance. When you order travertine for your kitchen countertop, you can opt to have them filled or unfilled. The harder type of travertine can be polished to a glossy finish. The less hard travertine has a ‘honed’ finish, which is similar to a matte finish. Another finish is ‘tumbled’ which makes the surface looked weathered. Travertine kitchen counter tops look beautiful because of the range of colors available, giving the homeowner plenty of choice. Travertine can be filled and sealed to prevent staining and scratching. Though not scratch resistant, buffing can conceal the scratches. Travertine is susceptible to acids and needs regular maintenance. Wood kitchen countertops or butcher block, as most are called, are amazingly versatile and strong along with their ageless look. Even if the cost is a little more than you budgeted for, few kitchen countertop materials can match the appearance of traditional wood. Wood can look both decorative and durable. The common woods used are maple, oak, and cherry. Teak and birch are also used, but because of their softness, they are better for decorative use. Wood can match any type of décor to bring on a cozy and warm look. If you are looking for variety in color and design, you will not be disappointed. Wood comes in a range of natural grains. Also wood can be stained almost any color to add to its versatility and range of looks. Since wood tends to expand and contract in reaction to moisture and temperature, it needs to be treated and seasoned to avoid damage. Depending on the seasoning and finish, there are different colors available in kitchen countertop materials. There are different kinds of finishes. In some woods varnish or lacquer are used for sealing and this can help alter the look to achieve the kind of color you want. These finishes form a film on the wood. There’s another kind of finish used to enhance the natural look of the wood. Here vegetable oils or mineral oils are used. These penetrate the surface of the wood and seal the pores. You can make your kitchen countertop using a single block of wood or by assembling different pieces to get a unique look. The kind of wood you will opt for will depend on your usage. For those who spend a lot of time cooking, hard maple or oak can be more long lasting than other woods. Remember to get the wood finished in order to increase the life of your countertop. In terms of care, it is advisable to keep your countertop clean since any warps or cracks can attract bacteria. In fact, kitchen designers will advise you to use separate cutting boards rather than use the countertop surface directly to avoid any nicks and cuts. Any spills should be wiped clean and dried. Well-treated wood countertops can be stain and moisture resistant. They also do not get easily scratched. If you go for a butcher-block kitchen countertop, you can even use the surface as a cutting board since this will not damage the surface. Wood has to be seasoned and finished well in order to be durable. Wood also has a tendency to burn, so you need to be cautious while keeping really hot things on the surface. Also, knives and other sharp items can damage the wood’s surface.